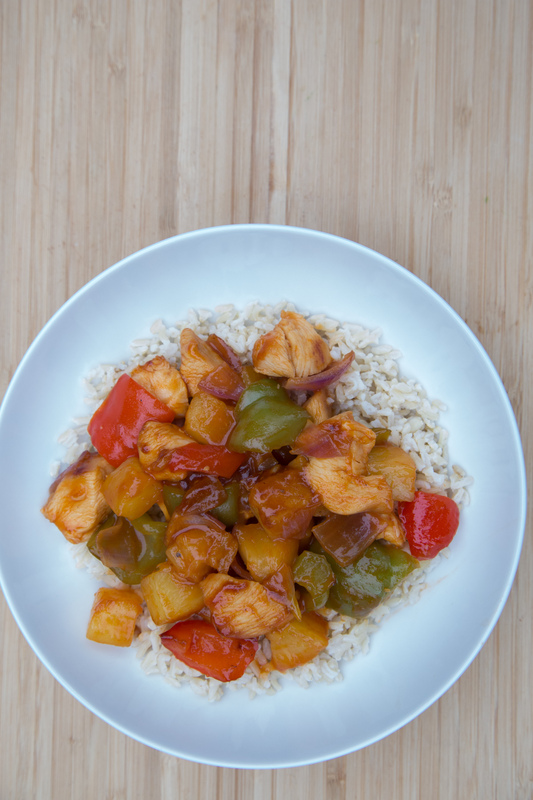 A slow cooking twist on a classic “fakeout-takeout” meal - Sweet & Sour Chicken. Please make note of when the cornstarch is added :) We hope you enjoy this as much as we do! Cut the chicken breasts into bite-size pieces. Seed and dice the red bell pepper into 1-inch pieces. Drain and reserve the pineapple juice from canned pineapple chunks in a small bowl. With the pineapple juice, add the chicken stock, brown sugar, soy sauce and minced garlic. Place the chicken pieces and red bell pepper pieces in the base of the slow cooker and pour the pineapple chunks around the chicken. Season with a sprinkle of salt and pepper. Pour the pineapple-soy sauce mixture over the top. Set on low and cook for 8 hours. With 30 minutes left in the cooking cycle, swirl the cornstarch with a few Tbsp of water and stir it into the sauce. Cook for 30 more minutes to allow sauce to thicken. Garnish with sesame seeds, if desired. Cook the rice as directed. 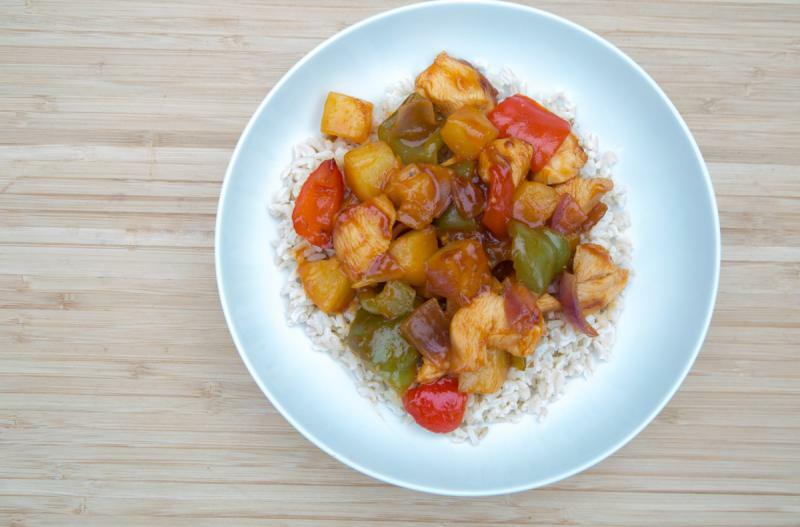 Serve Slow Cooker Sweet & Sour Chicken over rice with side of veggies. Cut 8 small chicken breasts into bite-size pieces. Seed and dice 2 red bell peppers into 1-inch pieces. Drain and reserve the pineapple juice from 2 cans of pineapple chunks in small bowl. With the pineapple juice, add 1 1/2 cups chicken stock, 1/2 cup brown sugar, 6 Tbsp soy sauce and 2 tsp minced garlic. Do NOT add the cornstarch before freezing. Put baggie in the freezer and freeze up to 6 months in fridge freezer or 12 months in a deep freezer. Thaw in the fridge overnight, or a warm bowl of water for about 20 minutes, before transferring to the slow cooker and cooking on low for 8 hours. Thicken with cornstarch at the end of the cooking cycle as directed. Recipe is gluten-free if you use gluten-free soy sauce. Thaw and slow cook on low for 8 hours. With 30 minutes remaining in cooking cycle, stir in the cornstarch to thicken sauce. Serve with sesame seed garnish, over rice with veggies.